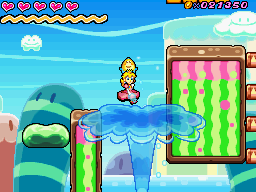 Wavy Beach 5-3 is the third level of Wavy Beach in Super Princess Peach. The level begins next to a giant Springboard that leads to some switches that can be used to turn the waterfalls off. Underneath this platform are a large amount of coins. At the end of this section is a Warp Pipe that leads to the next area. The next area is a grassy one with several Spinies, and a switch that makes some platforms appear by a mountain. During the climb, if the player jumps on the top spear, they can get to a Toad. The next area has lots of water, and a geyser, that the player must use the Joy vibe on to make it shrink and rescue another Toad. After this section are some Calm Lakitus. Underneath this platform, is an area where a Warp Pipe spawns beach balls, and the player can use them to get some more coins, before going to the Warp Pipe at the end of the section. The next section starts off with Bullet Bills being fired at the player, and they have to use various ladders to navigate the section. At the top of the room is a windmill, that the player must spin with the Joy vibe, so they can get some more coins. At the end of the section is a Warp Pipe. The next room has quicksand and various enemies, before its Warp Pipe. In the next area, the player needs to descend a mountain, whilst avoiding more enemies. Partway down the mountain is a sand creature that the player needs to use the Gloom vibe on so they can get the final Toad. At the bottom of the mountain is a Warp Pipe that leads to the next area. After exiting the Warp Pipe, the player is in an autoscrolling Subrella section, where they need to avoid various underwater enemies, before getting to another Warp Pipe. In the next area are some platforms above water and a Mad Green Paratroopa, before the player reaches the goal gate.